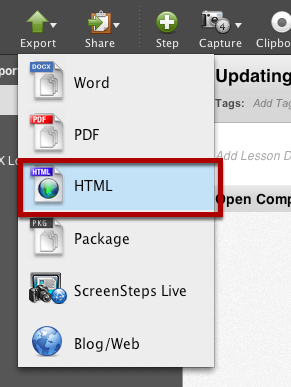 This lesson will show you how to add HTML output from ScreenSteps to a RapidWeaver page. Begin by exporting your ScreenSteps lesson to HTML. In this example I exported using the default Black BG template. Once you have exported the lesson to HTML, open the resulting HTML file in Safari. 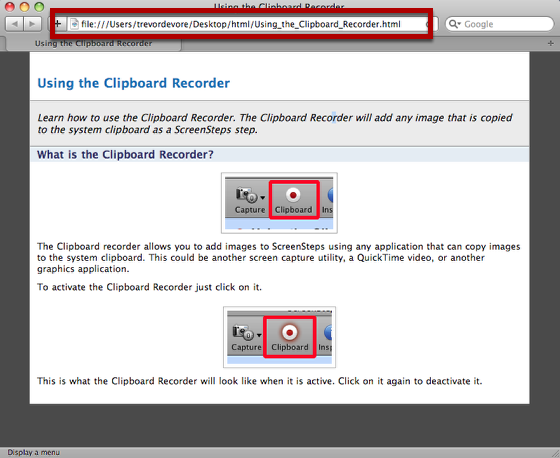 Select all of the web page contents by selecting Edit > Select. 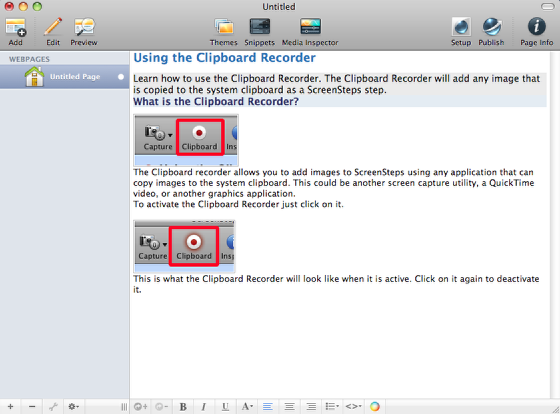 Now copy the selection to the clipboard by selecting Edit > Copy. 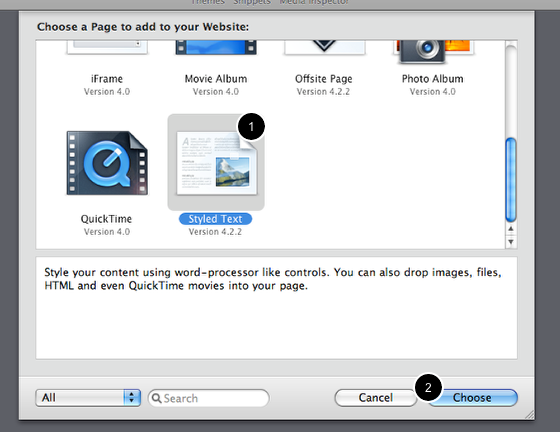 Now switch to RapidWeaver and create a new page using the Add button. Select the Styled Text (1) page and click Choose (2). 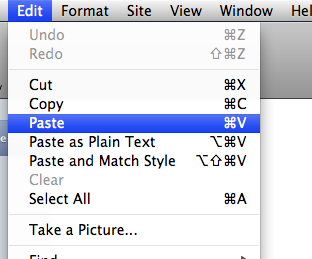 Once the page has been created you can paste the clipboard contents in by selecting Edit > Paste. 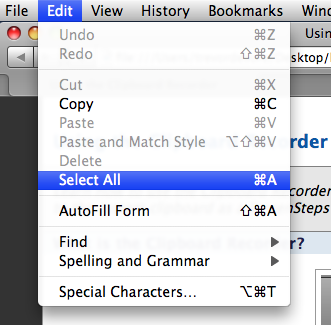 Your ScreenSteps lesson will be pasted in the RapidWeaver page. Click the Preview button to see what the lesson will look like within your site. Make sure you use Safari. It doesn't work with Firefox. In Firefox, only the text gets pasted into RW. With Safari, the images come across just fine. Great tip for those of use who use both applications. We have worked out a better way to put a manual into a website built with RapidWeaver that preserves all of the links within the Table of Contents. 1. 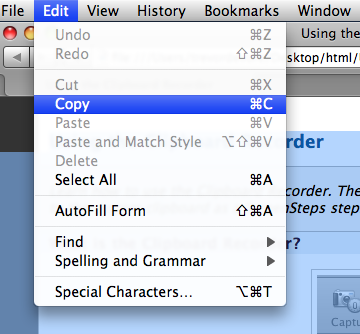 From ScreenSteps (SS), export your manual to HTML. 3. Select all and copy. You can close TextWrangler. 4. 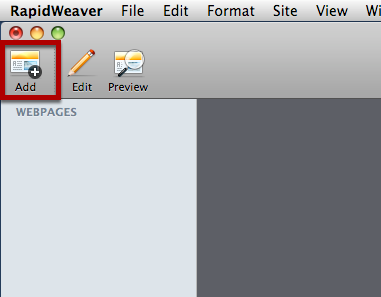 Open RapidWeaver (RW) and create an HTML page. Do not place the Manual page under any other page. Paste the HTML you copied via TextWrangler into that page. 5. 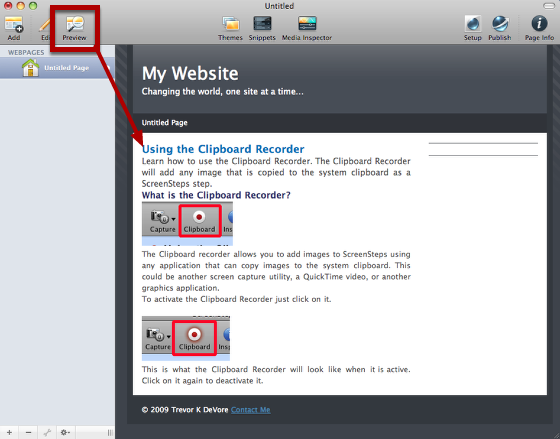 With RW opened to your new page, go to Page Inspector. Give the Page Title whatever name you choose. Next, name the Folder “manual”. Finally, enter the Filename. It must be same as the SS filename, e.g. "yourmanualname.html". Note that Filenames are case sensitive. The ultimate URL should be www.yourdomain.com/manual/"yourmanualname.html"
5. Save and publish RW to your website. 6. On your computer, find the folder "Lessons" created by SS and upload it to the folder titled “manual” on your website via FTP. 7. Confirm your URL path = yourdomain.com/manual/yourmanualname.html.